The area of the brain used to control the hand gets used instead to support the lips, feet or arms of people who were born with only one hand, finds a new study led by researchers at UCL and the Weizmann Institute of Science in Israel. "Our brains have evolved over millions of years so that a specific area of the brain becomes specialised in controlling hand function. And yet here we've found it can still be used to control another body part if someone was born without that hand," said the study's senior author, Dr Tamar Makin (UCL Institute of Cognitive Neuroscience). For the study, published today in Current Biology, 17 people who were born without one hand and 24 two-handed controls completed tasks such as opening a bottle, folding laundry or taking cash out of a wallet. Those with one hand had different strategies such as using their lips, legs, prosthesis or residual arm to do something most people would do with two hands. They were then asked to move those body parts while in an fMRI scanner. The scan showed that the "hand area" of the brain's sensorimotor cortex was being employed by those body parts one-handers used instead of their hand. "We tend to think of brain reorganisation as a battle for resources, but here we've found there's more flexibility than previously believed, as we see the arms, feet and lips all using the same area of the brain," Dr Makin said. While the study isn't the first to show a body part invading a different body part's cortical territory, it's the first to show multiple body parts benefiting from the same area, which weren't even adjacent areas. The areas that typically control the lips and feet are both 60 mm away from the hand area. Dr Makin said the findings could also challenge conventional wisdom in the field that the brain is mapped based on which body part each brain region controls. "We call this area of the brain the 'hand area', but perhaps it's not really the hand area, but the area controlling whichever body part enables us to interact with our environment. Most people use their hands for the same functions, so this area is almost always used to control the hands, but perhaps it's actually specialised based on function and not body part," she said. "It's amazing to think of how daily behaviour can potentially sculpt the brain's functional organization," added lead author Avital Hahamy, who works with co-author Professor Rafael Malach in the neurobiology department at the Weizmann Institute of Science. "The brain can flexibly assign resources, such as those of the hand region, to enable daily compensation for the hand's absence through various other body parts. So it seems that the brain's organization is not predetermined, and can alter to support multiple adaptive behaviours," she said. The authors say they hope their findings could lead to more research into how to best integrate assistive and augmentative technology such as artificial arms, if researchers can gain more insight into the process of brain reorganisation. "If we could harness this process of brain plasticity for medical purposes, and help people use different parts of their brain, it could be an exciting tool to improve people's health and quality of life," Dr Makin said. The research was supported by the Cogito Foundation, Wellcome and the Royal Society. 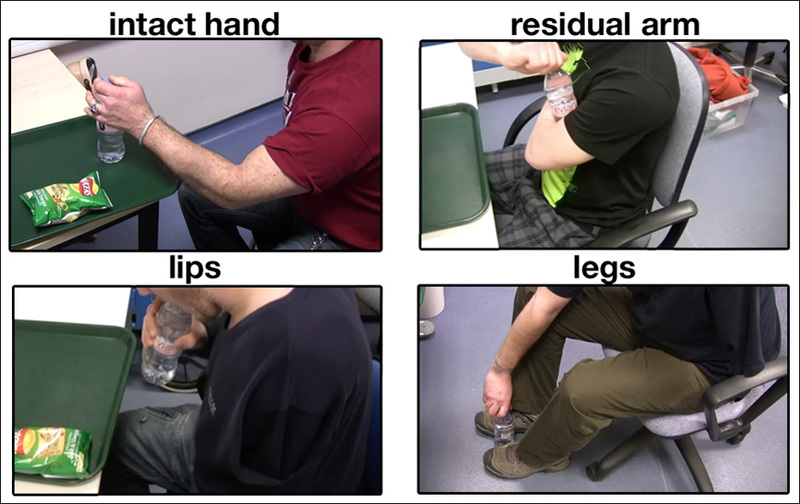 Study participants, who were born with one hand, completing the study task of opening a bottle. Image courtesy of research team.